reflection meeting | doberman pizza. hey hey hey hey have some photos! 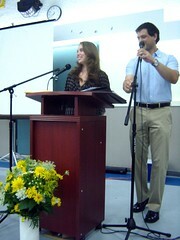 I’ve posted the photos from the ottawa Baha’i community’s recent reflection meeting. In response to comments, I tried to take a lot more face shots this time instead of back-of-head shots and crowd shots. hopefully this helps convey the active, participatory nature of reflection meetings. this weekend’s meeting wrapped up an exciting cycle (in which twenty people declared their faith in Bahá’u’lláh in only a few weeks—something Ottawa hasn’t seen in a very long time), and set a great foundation for the next cycle. 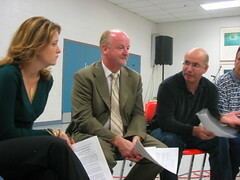 keep your eyes on this blog for more news as Ottawa’s intensive program of growth chugs along. Ottawa’s Baha’i community opened up the 10th cycle of its intensive program of growth on Friday night with loud whoops and hollers, African drums, singing, laughing and dancing. In fact, the assembled crowd seemed so joyous that they even interrupted the MC’s opening jokes with outbursts of applause. So, as a word to the wise: if you had the impression that reflection meetings were supposed to be sober occasions full of number-crunching and wringing guilty commitments out of people, then you desperately need to think again. There were two shining stars of the evening: first, those brave souls who were able to gain experience with “Anna’s presentation“, using it as a general yet complete overview to introduce seekers to the Baha’i Faith; second, those equally brave souls who participated in the first wave of the Fire and Snow initiative in Toronto and were able to report on their experience in glowing and inspiring terms. In both cases, the sharing was uplifting, exciting and inspirational—being evidence, as Regional Council member Todd Smith stated, of a “true change in culture” within the Baha’i community. Those people who attended Fire and Snow, they announced, will now be leading outreach groups in which all four core activities will be offered to the general public, similar to their recent experience in Toronto. Moreover, they’re inviting everyone (meaning everyone) who wants to learn about outreach to join them during the upcoming intensive phase (Aug. 4-19) in one of three outreach groups: one in Blackburn, one in Beacon Hill and one in South Keys. If you’d like to join up, you can either contact me and I’ll put you in touch, or contact someone like Marty or Sahba and they should be able to hook you up directly. All in all, it’s been exciting to see how reflection meetings have progressed in the last few years. When we first started holding them, they seemed like just another meeting—just another burden (an annoying one, to some) on our already-busy work week. They truly seemed to have changed into what seems like an indispensable feature of a joyous and uplifting culture of learning, encouragement, and growth. They’ve become something genuinely fun, full of celebration and inspiration, balanced with frank consultation and a serious sense of purpose. Personally, I take it as another confirmation of the infallibility of the Universal House of Justice—and that if we stick to the Plan and are wholly united in our efforts to carry it out, the promised benefits will be ours, without a doubt. OK so one more thing: I’ve added photos from this reflection meeting to a new photoset on flickr called baha’i reflection meetings, along with a bunch of other photos from previous reflection meetings. Check ’em out! well it’s been an intense week for sure. the Ottawa Baha’i community held another reflection meeting last Saturday, launching the eighth cycle of its intensive program of growth. JARGON WATCH: basically what this means is that a bunch of people got together to reflect on and discuss the growth, vitality and vision of the Baha’i community, to share their best practices and to set goals. 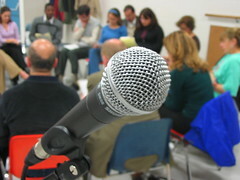 An “intensive program of growth”, which is composed of many “cycles” marked by these “reflection meetings”, is basically a way for Baha’is (and those who throw their lot in with them) to manage the growth of the Baha’i community and channel their efforts to bring the Message of Bahá’u’lláh to those who are out there waiting for it. it was a blast, as usual; there were lots of young people there, junior youth (12-14 yrs) and youth (15+ yrs) alike. That was awesome and really encouraging. we put someone on a table and lifted them up with only our fingers. apart from that, of course, we had time to knock heads together and make plans for the next few months: how we would help the core activities grow and evolve, etc. MORE JARGON WATCH: there are four generally recognized “core activities” of Baha’i community life, all of which are, in essence, open to all people no matter what their faith: (1) “devotional meetings”, which consist of shared prayer and readings that bring a group closer to God / a Higher Power; (2) “study circles”, in which groups use the study of principles found in the Baha’i Writings to understand how they apply in real-world situations of service; (3) “children’s classes”, which are classes for the moral and spiritual education of children; (4) “junior youth groups”, in which 12- to 14-year-old youth use spiritual principles to understand the world around them and to bridge the gap between childhood and adolescence. I spent a bit of time sharing the plan for our children’s class… it’s a complicated animal. So far it looks like we will be moving towards splitting the class into two groups: one for older children (say, 9-11) and one for younger children (~5-8). We’ve also discussed holding a devotional meeting open to parents, family and friends – we’re looking for ways that parents and family can naturally become more involved in the children’s spiritual education, and sharing prayer time with them in the format of a devotional meeting may just be the thing. also on the map are home visits with parents and family to follow up on the parents’ meeting we had last October – they haven’t had much regular communication from us and it’d be about time to bring them each up to speed no? hey – just a note to let you know that pictures from the reflection meeting at the Glebe Community Centre last Sunday have been posted up – where else? – on my flickr site. Check ’em out. Go 4th cycle! hey. this is just to remind you that the Ottawa Baha’i community’s next reflection meeting will be held this Sunday, December 18th, 2005, at the Glebe Community Centre, 690 Lyon St., from 2:00-5:00 PM. Judging from the past few reflection meetings (see the September 2005 and February 2005 versions blogged here), this one promises to be fun, dynamic, and infused with an infectious spirit of love, encouragement, and unity. Baha’is and their interested friends are welcome – there’s plenty of room for all. Over the weekend, the baha’is of Ottawa experienced what can arguably be called the best reflection meeting in their community’s long history. Organized by a tirelessly devoted Teaching Committee (who selflessly volunteered weeks of work, sometimes meeting ’til up to 2 AM, in order to pull it off) and backed by the love, encouragement and active engagement of the various Institutions of the Faith, the meeting brought together what must have been over a hundred individuals from across the city to share their experiences in an atmosphere of learning and encouragement. To hear the reactions of those participants who attended the city-wide Feast the next evening, it was a smashing success that was universally enjoyed. The materials presented at this reflection meeting were clear and easy to understand, and even fun (when someone calls a PowerPoint presentation “fun”, you know it’s a big deal). The arts played an important part in making this meeting special, from the Official Video launching the 3rd cycle of growth to the spontaneous singing that broke out during the meeting. The facilitation was expert, including the reading of recent guidance and profound consultation with members of the local and national Spiritual Assemblies, the Baha’i Council of Ontario, Assistants and Area Coordinators. Perhaps what was most special was the presence of the entire National Spiritual Assembly of the Baha’is of Canada, fresh from their weekend-long meeting held in the newly-acquired Ottawa Baha’i Centre, who shared with us their love, their greetings, and their words of wisdom and encouragement. Many thanks to all those who made this meeting possible. I can’t wait to see what this new cycle of the intensive program of growth will bring! For more information about Ottawa’s program of growth, you can check out Martin’s summary.